Go from fine to Phenomenal! Team building is the key to transforming your business. It’s not candy-coated fun, a day at the spa or worthless consultant rhetoric. Team building should build strengths, fill gaps, and eliminate the headaches of managing motivation and increasing productivity at work. As “team players” ourselves, we get it… we have the tools to bring it to you. It’s not the usual fun and games – it’s rigor for deep development based in simulations and our honed skills in holding people accountable to their excellence. We deliver team building right here in Austin, Texas. Of course, we travel the country – Dallas, Houston, San Francisco, Seattle, L.A.? We’ve got you covered. Get right to our training options here. Or just call us now; our easy process takes all the guesswork out. Source Consulting Group (SCG) takes your current staff, employees and corporate team through process, not package, turning them into powerhouses of teamwork, motivation and success. With our experiential learning programs for team building, we help develop behavior and set a context for employee and team excellence in the corporate world. Our team building programs build cultures for high-trust, emotionally intelligent, accountable, effective leadership. We build cultures where team members are aligned, innovative, inspired and committed – every day, not just that fleeting “high” after a motivational workshop or seminar. See our training options here. Below is a quick snapshot of our services we offer, just a few of the many possibilities to engage, grow and build the team you envision. 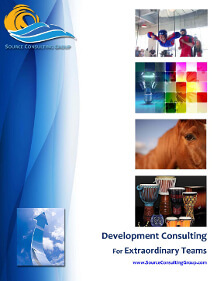 These are only highlights: we customize and design our programs to nail your specific objectives, every time. We do the research and the legwork to build your team; you get to enjoy the results. High Performance is more than a concept. It’s more than an ideal reached by an elite few. Elevate your team development for sustained impact. Explosive, cutting edge, original, innovative… and that’s just scratching the surface. Discover a new way to tap your team’s brilliance. Youth: Engage Them, Inspire Them, Energize Them. Like never before! Forget stale trainings and boring keynotes. Go with learning that sticks, sessions that rock, experiences that change behavior builds leaders – true game changers for the very people who will impact the world in profound and powerful ways.